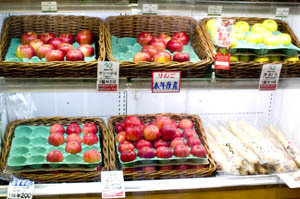 Apples are Aomori's signature agricultural product, and this Aomori antenna shop sells fresh apples, apple juices (including single-varietal juices), apple-juice vinegars and ponzu, apple brandies, dried apples, apple jellies and apple-flavored soy sauces and salad dressings. 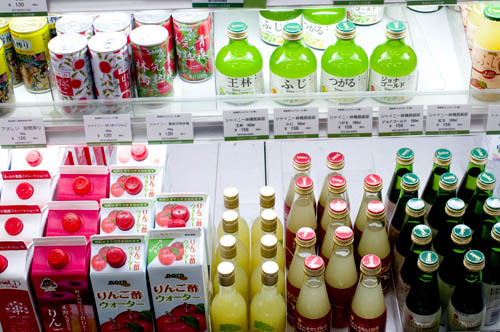 Tomato juices and jellies are also well represented. 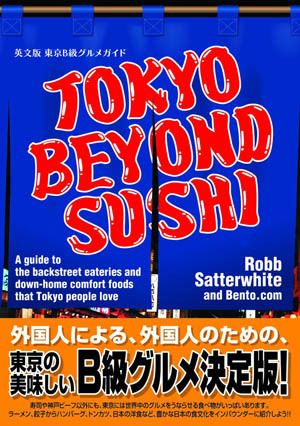 There's also fresh garlic (white and black), garlic products, takuan pickles, honeys, dried scallops and squid, and frozen hokke and other fish. 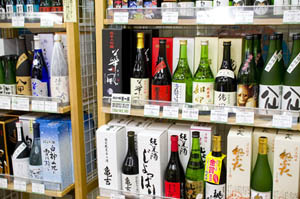 Of course there's a good selection of a couple dozen sake in bottles of all sizes, including limited-edition seasonal labels. Unfortunately they play nonstop shamisen music, which is also available to take home from the CD section of the store.